Do you find it therapeutic to create? Taking a break from screens and indulging in some unstructured creative play can help you relax and unwind. It's no wonder that the popularity of mindful adult colouring books has risen over the past few years. The same meditative qualities of colouring-in can be found in creating simple geometric arrangements using pattern and repetition to ground yourself and find calm. Alternatively, participating in more active creative activities can be highly energising, bringing immense satisfaction and joy. Playing with colour can enhance your mood and the idea that applying different spectrums to find balance and bring harmony is found in many different schools of thought. Why not take an intuitive approach to colour play and experiment with the colours you are naturally drawn to; the chances are you will be able to easily access your chosen colour palette using items from your home, garden or pantry. We have a very special guest blogger this week who knows a thing or two about having fun with a splash of colour. 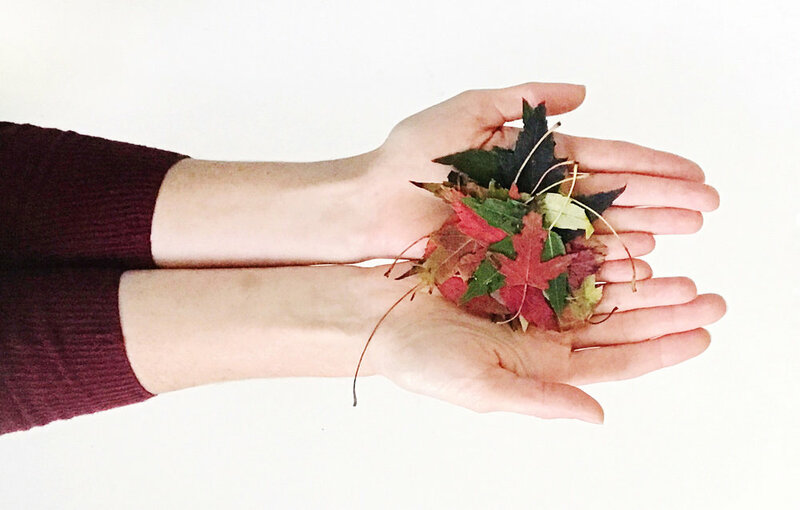 Hanni, the creator of the beautiful Instagram account @craftplanter finds joy in the arrangement of foraged treasures and everyday items. Hanni's aesthetic is experimental, playing with scale and shape while exploring all the colours of the rainbow. Creative Ideas come to life within these colourful squares and Hanni's arrangements are a vibrant medley of organic and structured compositions. 1. Start by gathering your objects. I am a huge proponent of using what you have around you. (I've made plenty of flatlays with toys my kids have left on the floor!) Look for objects that are small and that you have plenty of. Go on a walk and gather treasures from nature, peek inside your pantry, or raid your craft closet. The possibilities are endless! If you are crating a complicated flatlay, keep your background clean. I usually use a plain old white posterboard! You can experiment with a more textured background (such as a wooden table or pages from an old book) if you are creating a simpler design. 3. Decide what shape to create. I gravitate toward making squares with my flatlays (which I've nicknamed "flatsquares"), but you can create any shape you desire. Do you want your final design to create a circle? A star? A map of France? I sort my finds by color...you could also sort by size or texture. It's MUCH easier to find that one tiny blue piece that you need if it's sorted out ahead of time! Here's where the magic begins! Start laying out your items, keeping like with like as much as possible. Your flatlay will be more visually pleasing if all the green objects are together and transition into all blue objects. (The one exception to this I can think of if you are creating a repeating pattern.) Minimize the space in between items - they should not be touching, but should be very close together. There's no right or wrong here! Just relax and keep moving your objects around until you are pleased with the result. It's eerily similar to playing a game of Tetris! Flip things around, rotate them, turn them on an angle. If a piece isn't working, you don't have to use it! If you were planning on making a circle, but it isn't working out, switch it to a square. You are making the rules here - you can change whatever you want! Take your photograph directly above your flatlay, being careful not to step on it. (I've done that more than once!) I always *always* look at the images before taking the flatlay apart. A photograph will often showan edge that's not straight or an object slightly misaligned that I've missed. Once you have an image you are satisfied with, crop and edit as you desire.